This week has been a busy one for all our seniors as they complete their comprehensive examinations. In a salute to their hard work, I offer this photo. 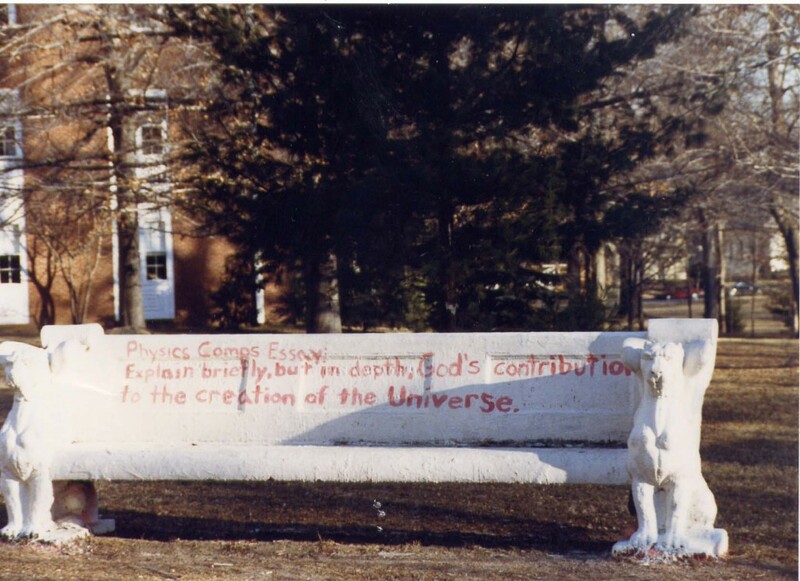 This 1989 creation might be one of the best bench paintings ever, “Physics Comps Essay: Explain briefly, but in depth, God’s contribution to the creation of the Universe.” In that one sentence is every student’s conundrum, “explain briefly, but in depth”. The seniors come back early from winter break and many of them study here in the Library. Gone is the horseplay, gone is the lighthearted joking around. These guys are serious and focused! As comps week is passing, our seniors are walking a little taller. They have made it through the last, great challenge as a Wabash man. Now to finish well in their classes and on to Commencement!